JAKARTA/SOLO – Early results in Indonesia’s legislative elections held Wednesday showed pre-vote favourite the Indonesian Democratic Party of Struggle (PDI-P) falling well short of a hoped-for 30 per cent showing, with concerns that the party could even fail to cross the 20 per cent threshold needed to nominate a presidential candidate without the backing of a smaller party. Early tallying of votes showed PDI-P posting just short of 20 per cent of the vote. Going into the April 9 poll, the PDI-P hoped that pitching Joko Widodo – the flesh-pressing, popular governor of Jakarta – as its presidential candidate would lift the party back to the heights attained in Indonesia’s first post-dictatorship election in 1999, when it won 33 per cent. “He is a good man, a simple man. Everyone here likes him,” said teacher Hernawan Tri Wahyudi, speaking in Solo, Joko Widodo’s hometown, where he forged his political career as mayor before winning the Jakarta governorship in 2012. But, added the teacher, backing Joko Widodo, who is widely known by his nickname “Jokowi,” does not mean a vote for the PDI-P in the legislative elections. “I vote number three,” he said, referring to the ballot number of the Prosperous Justice Party (PKS), an Islamic party that won 7.9 per cent of the vote in 2009 and was again among a group of religious parties hovering between 6.5 and 9 per cent this time around – an outcome being taken as a sign of voter disaffection with establishment parties and politicians in what is deemed one of the world’s most corrupt economies. Back in Jakarta, student Mala Mili, speaking while canvassing for donations for retired Indonesian army officers, said she would vote for either Golkar or Gerindra, the parties that were emerging as the next two biggest after the PDI-P, with just above 14 per cent and just under 12 per cent of the vote, respectively. So why not vote PDI-P? 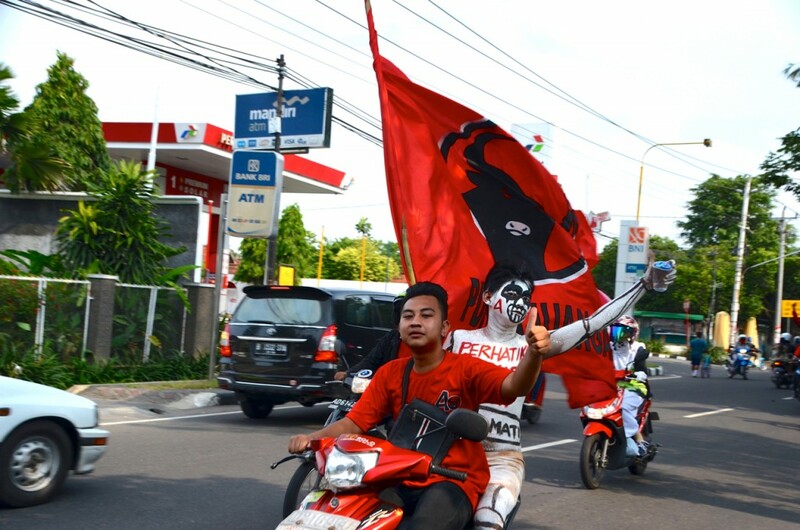 “ I don’t like Mega,” said the student, referring to PDI-P leader Megawati Sukarnoputri, a former Indonesian president who was later twice a losing candidate. 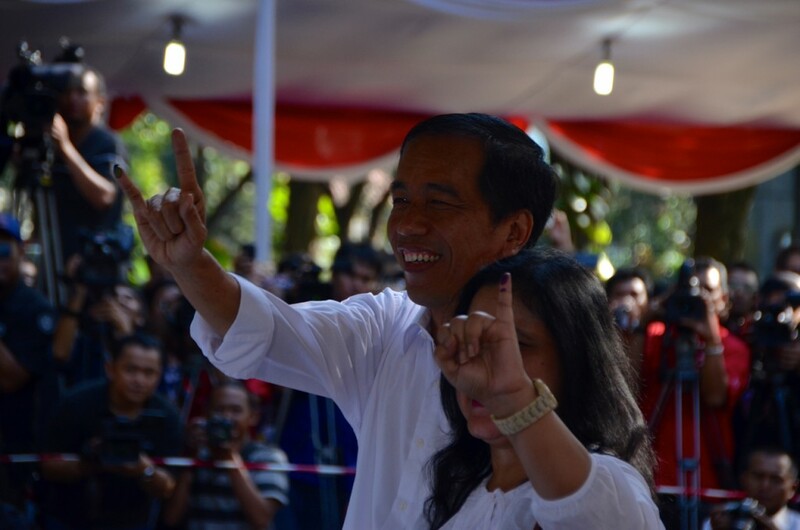 Megawati took a step back this time to allow Joko Widodo be the party’s poster boy ahead of the legislative elections. As many Indonesian voters have suggested, the April 9 legislative elections centered more on personalities than on parties or policies. With Joko Widodo hogging the spotlight, rivals such as former Army General Prabowo Subianto have taken to gambits such as parading around election rallies on horseback, while smaller parties have recruited dangdut singers (a form of Indonesian pop music) as candidates and jazzed-up rallies with skimpily-attired dancers. But even “Jokowi-mania” was not enough for the PDI-P, it seems, and within a few hours of the close of voting, Joko Widodo was on Indonesian television dancing around questions about whether the outcome, though preliminary, amounted to a letdown for the PDI-P.
Official results will not be available until May 7, but the preliminary numbers from Wednesday’s vote should help Golkar leader Aburizal Bakrie and Gerindra’s Prabowo retain some hope for their respective presidential candidacies, even if Joko Widodo’s personal support far exceeds that of the PDI-P.
Aburizal Bakrie spent the afternoon on Wednesday watching exit polls on wall-to-wall big screens at the party office in west Jakarta. “We expect we will still be number two, or even still number one, when the final results come through,” he said, referring to the voting gap between Golkar and the PDI-P.
Prabowo, until now regarded as a distant second-place challenger to Joko Widodo in any presidential race, was even more bullish. “I am very confident,” he said, when asked if he could still win the presidency. 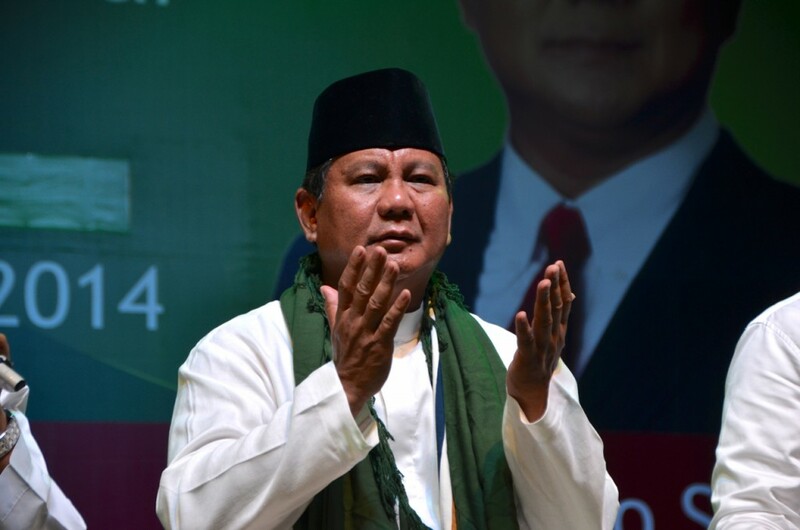 Prabowo was speaking after spending the Friday before the vote campaigning with Suryadharma Ali, leader of another religious party, the United Development Party (PPP), and religious affairs minister in the government of President Susilo Bambang Yudhoyono. Gerindra and the PPP are likely partners as the country’s political parties get into the deal-making and coalition-building ahead of the July Presidential election. How that all pans out is guesswork at this stage, with speculation centering around whether two or three formations of parties will end up fighting for the presidency, according to Evan A. Laksmana at the Centre for Strategic and International Studies (CSIS) in Jakarta, with bigger parties hoping to get the backing of smaller parties by offering ministerial positions and a shot at the vice-presidency. “A lot of the bargaining for the coalitions would depend on the future governing coalition ‘splitting of the pie,’” said Laksmana.